October 29, 2015 – In this special, Halloween episode, we’re traveling back to the days before the American Civil War, when doctors would take their scalpels to fully awake patients — the pre-microbial era when the causes of common diseases remained a mystery, and when oil lamps and flammable clothing combined to engulf a staggering number of people in flames. This, was the age of monsters. Yes, monsters. Not costumed Groovie Goolies, but human beings so scarred and broken, that they often longed for death. And so they were called… monsters. Enter the brilliant surgeon who gave these monsters hope, and made it his life’s work to piece their lives back together. His name, was Dr. Thomas Dent Mütter. 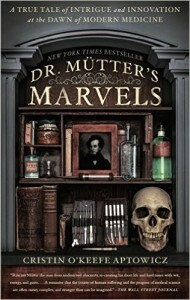 Poet and author Cristin O’Keefe Aptowitcz tells the story of his amazing medical breakthroughs in Dr. Mütter’s Marvels: A True Tale of Intrigue and Innovation at the Dawn of Modern Medicine. Cristin is an award-winning writer and the author of seven books. You can visit her website, Aptowicz.com and follow her on Twitter @COAptowicz. We’re also giving away two tickets to the Mütter Museum in Philadelphia on our Facebook page, courtesy of the author. To enter, just listen to the show, visit the page and leave a comment. Because the only thing better than a trip into the past, is a free trip into the past for you and a friend.